Carlo Lamagna was born in the Philippines, and lived in Detroit, Michigan until he was eleven, where he returned to the Philippines to attend high school and college. It was in the Philippines that his palate started to develop and his interest in cooking started to take shape. Starting out as a psychology major in college, it wasn’t long before he made the change to pursue his passion for cooking and at twenty moved back to Michigan to be near his family and to begin his culinary career. Lamagna cooked at several restaurants and private clubs in Detroit all while attending Macomb Culinary Institute to pursue his first Associates Degree in the culinary field. 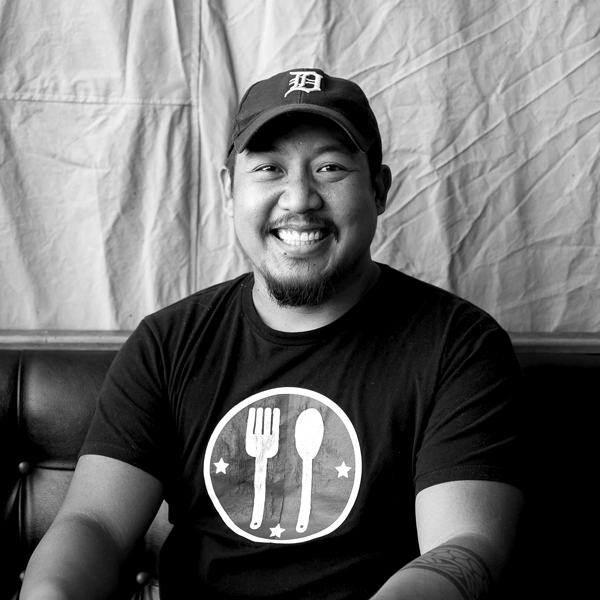 From experience at the prestigious Detroit Athletic Club to time spent learning sushi and helping a friend open a Thai restaurant, Carlo kept seeking out opportunities to learn and grow in the field. It was his training at the Country Club of Detroit though, under Certified Master Chef Brian Beland, that helped solidify his fundamentals and push him toward the next level of his career. It was at the CCD that he decided that he wanted to further his education and went on to attend the Culinary Institute of America in Hyde Park, New York. Carlo’s time at the CIA was used to further develop his understanding of cooking fundamentals as well as taking advantage of the close proximity to Manhattan and it’s surrounding boroughs. Carlo would travel into the city during weekends to stage in as many of the top restaurants as he could. It was his experiences in the city and school that created a desire to continue to pursue a higher level of cooking. After graduating with honors from the CIA, Carlo moved to Chicago and worked under chef Bruce Sherman at North Pond where he learned the importance of seasonality and supporting local farmers and purveyors. Carlo quickly rose through his ranks and was promoted to sous chef in just a few months. After spending two years there it was Carlo’s drive to improve that led him to Europe, traveling and staging in Germany, France and Spain to gather more culinary perspective. Back in Chicago, Lamagna started working with chef Paul Virant, whose vast knowledge of preserving and pickling opened Lamagna’s eyes to a different way of incorporating these techniques in upscale cooking. Beginning as a chef tournant on the opening team, Carlo quickly became sous chef and eventually chef de cuisine. During his time there, the Perennial Virant team received many accolades, including recognition by the Michelin Guide on the Bib Gourmand list. It was at the same time he began his pop-up series, Twisted Filipino, which was dedicated to his father, who had passed away in 2009. These dinners helped him explore and push the boundaries of Filipino cuisine by mixing traditional flavors with modern techniques. Lamagna then moved on to his first Executive Chef position at Benny’s Chophouse, where the accolades continued to follow, including top three steakhouses according to Chicago Magazine. Although his time at the steakhouse was short, it was during his time there that Carlo was offered a job across the country in Portland, Oregon at the James Beard nominated and nationally recognized Clyde Common. At Clyde Common, Carlo quickly adapted to the bustling atmosphere and helped breathe new life into the established restaurant and bar. With the encouragement of owner Nate Tilden, Carlo began pushing the menu to reflect his personal experiences. It was there that he started adding Filipino flavors and dishes to the menu and helped introduce Filipino cuisine to a broader market. The Portland food scene began to take notice and embrace the otherwise then unfamiliar cuisine. After three and a half years at the helm of Clyde Common, Carlo Lamagna stepped down to continue to educate and showcase his passion for Filipino food through his popular Twisted Filipino Dinner Series while perfecting his own restaurant concept for Magna, a modern Filipino restaurant.